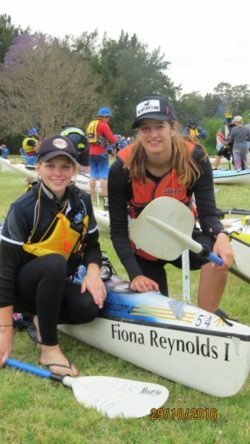 Congratulations to Abbey and Tilly who completed the Hawkesbury in 18 hours with just two 25 minute breaks, on a very mild but dark night with no moon, the final leg was a seven and a half hour stint with three and a half hours of sun and fighting an incoming tide and a changing tide. 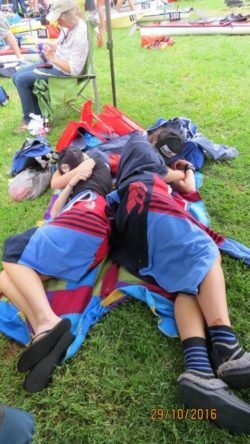 They started at 4.30 pm Saturday afternoon and finished at 10.30 am Sunday morning. They are fully exhausted, bruised, blistered and dehydrated. The enormity of this challenge even surprised me after witnessing it over the weekend. Many do not make it and vomiting and illness are a common theme throughout the night. The girls showed a mental and physical strength anyone would be proud of and even some humour. A huge thank you to the staff that sponsored the girls and showed them your support, it really motivated them and helped them approach the race with a great desire to do their best. Final fund-raising figures are not complete, but at this stage the girls have raised $770. The TAS staff that supported the crews were fantastic to our girls and a great help as were their other paddlers.